This project made me feel like a little kid again! 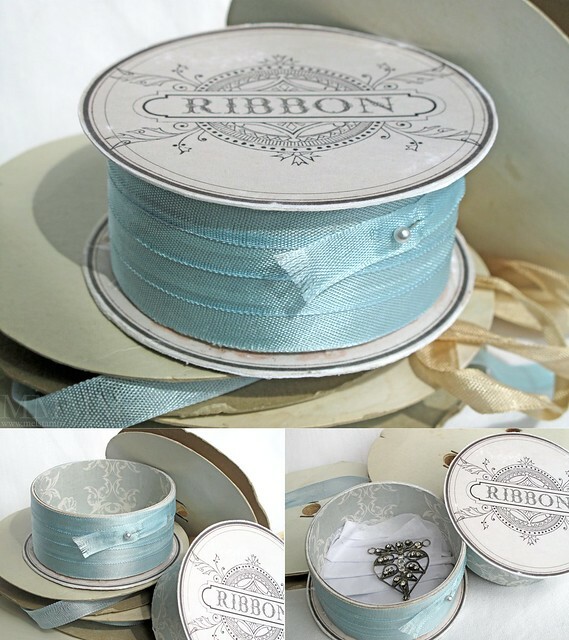 made to look like a antique ribbon. Mom: "Oh a spool of ribbon. Um. Thanks?" You: "Open it up, Mum!" A much better surprise for my Mom than that time (in my early misspent youth) when I used smooshed up blackberries to make an empty jewelery box with a hole cut into it (and my finger poking through the cotton) look like a severed finger I had found in the ditch. Sorry, Mom! (It was my Cousin's idea, honest!) :-D Not on Mother's Day, by the by, because that would just be wrong. You can find the 3D challenge page here on PCP. 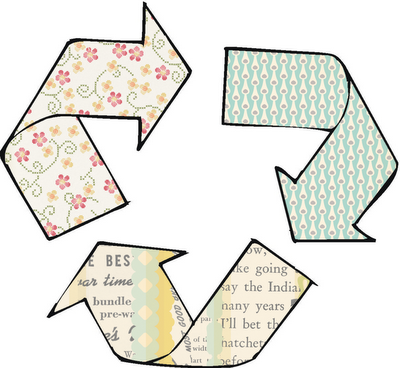 that you might normally recycle or throw out. 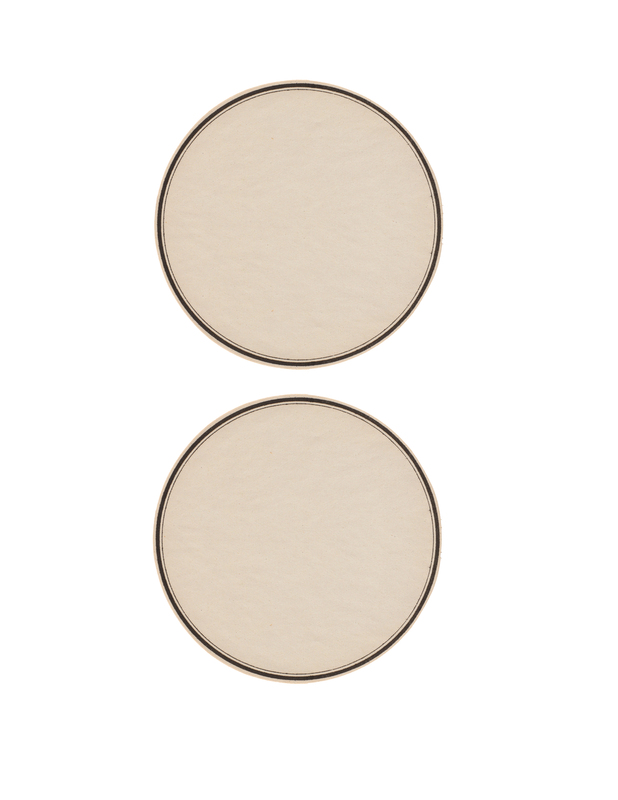 3D that's round (or that has round elements on it). 2) Upload your project to Paper Craft Planet. so that we can see what you've made! this label base, this label decoration & this free font. since I've included every last step. 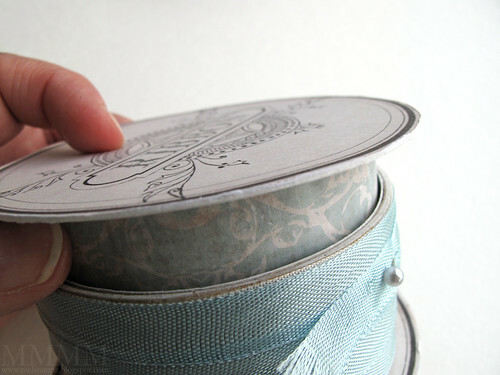 A) Cover two empty ribbon spool rings with patterned paper. 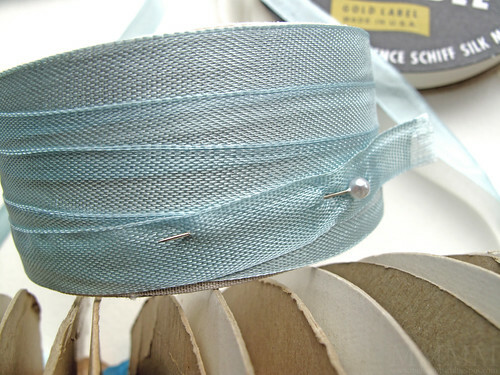 B) Add some ribbon to the bottom spool & a pin. 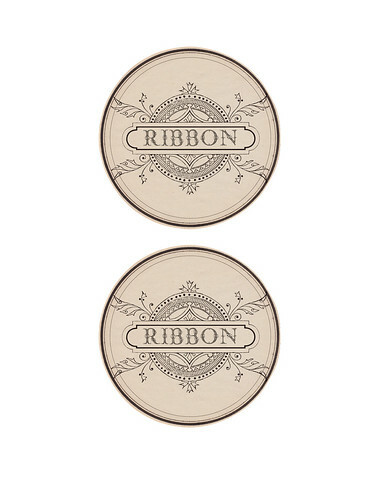 C) Stick printed labels on the top & bottom to finish it off. 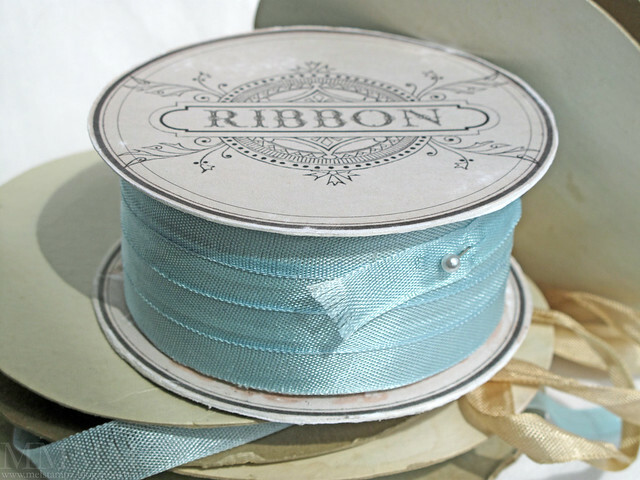 and it looks and feels just like a real spool of ribbon. 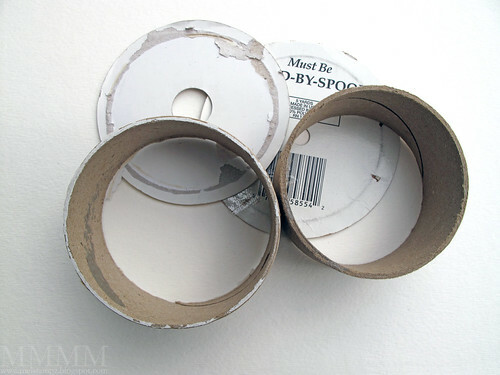 Step 1) Find two old ribbon spools and remove their labels leaving just the cardboard rings (if you don't have any ribbon spools, empty spools from packing tapes would work nicely as well). (With a little room to spare for paper layers). 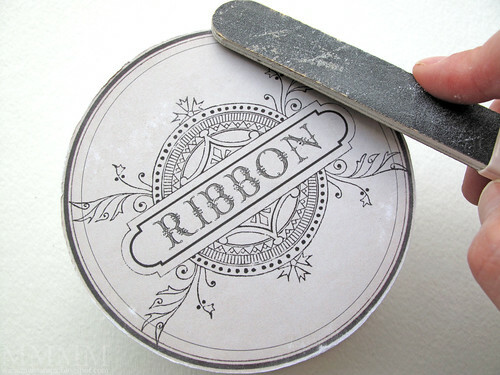 Step 2) Sand off any bits of paper left from the original ribbon labels. 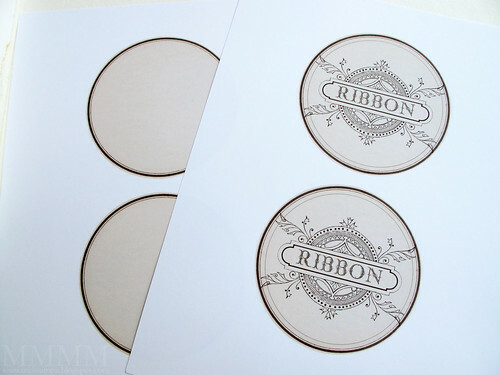 Step 3) Print the label printables front & back (They are available as free downloads above). They measure 4" in diameter, but you might want to re-size them to fit your ribbon/tape spools. 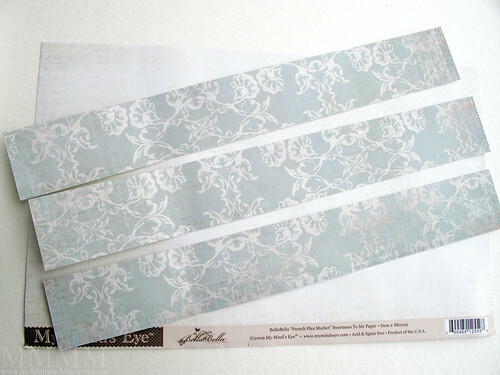 Step 4) Cut out all four labels. You could use a circle cutter, if you prefer. 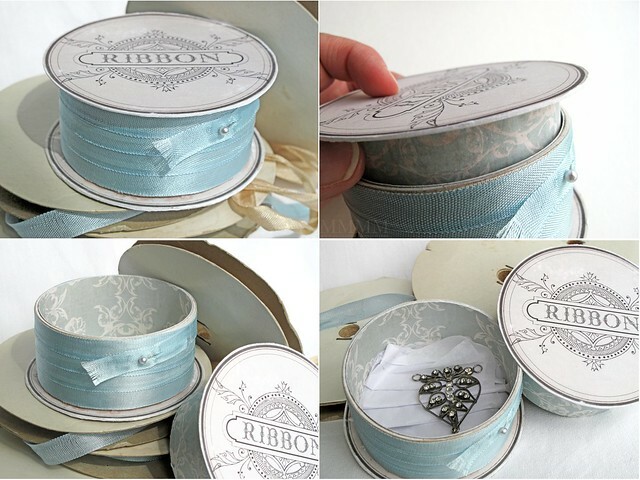 Step 5) To make a nice strong top & bottom for the ribbon box, you can adhere the decorative label fronts to watercolour paper or some other sturdy cardstock. Step 6) Cut the labels out again. 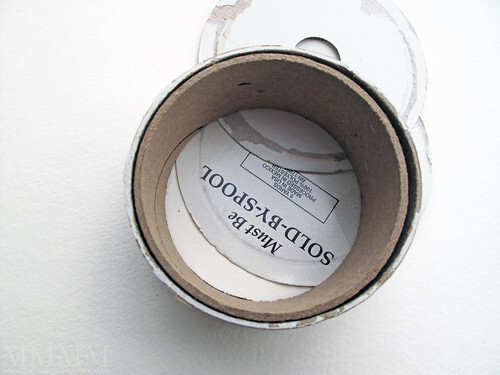 Step 7) Flip the front label circle over (so you can see the watercolour paper or plain cardstock side) and adhere the plain back label onto it. 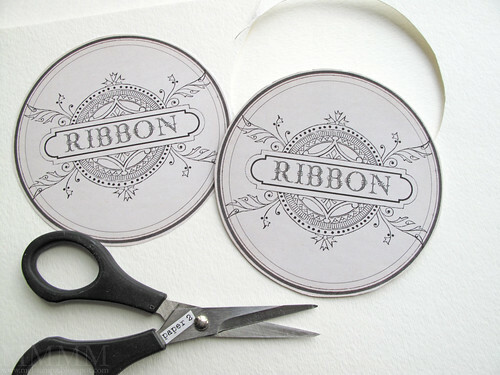 Step 8) Score the edges of your new double-sided labels with scissors to the edges out & distress them. 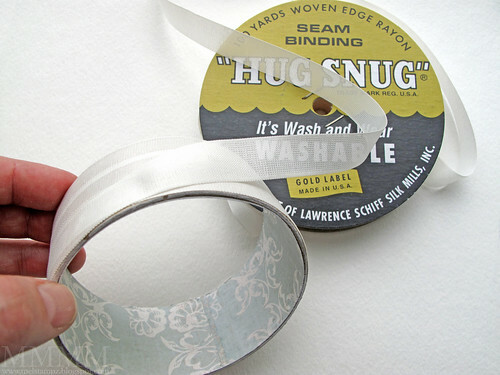 Step 9) Distress the fronts of labels to make them look all antiqued. 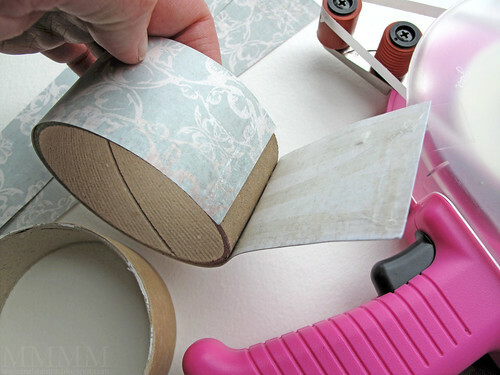 Step 10) Cut 3 strips of 12 x 12 patterned paper to fit the width of your ribbon spool rings. 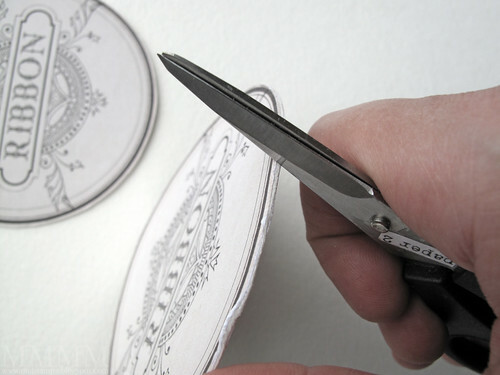 (Cut 2 to fit the 'top' smaller ring, and cut 1 to fit the bottom larger ring). 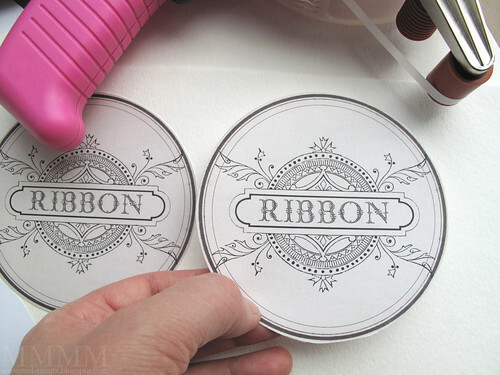 Step 11) To make round liners for the inside of the bottom & top, trace the inside of each ribbon spool ring onto the same patterned paper & cut those two circles out. 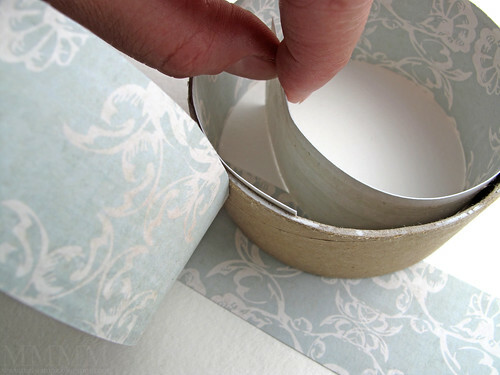 Step 12) Stick the patterned paper on the outside of the top ring. 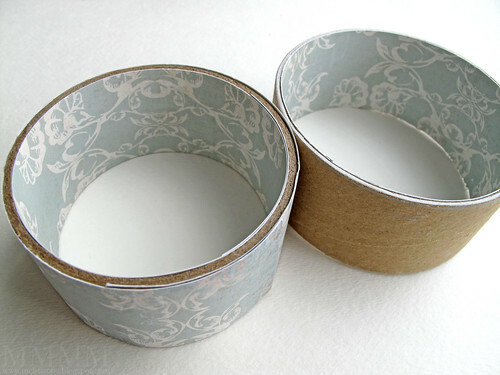 Step 13) Stick another strip of patterned paper on the inside of the top ring. 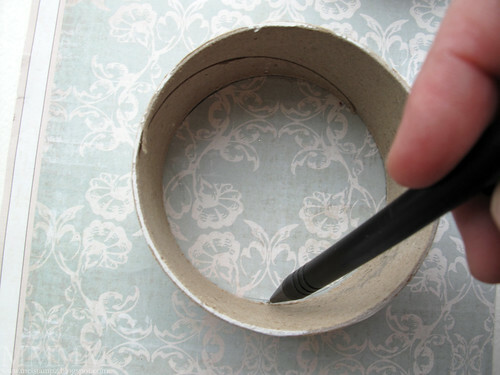 Step 14) Stick the final strip of patterned paper on the inside of the bottom ring. 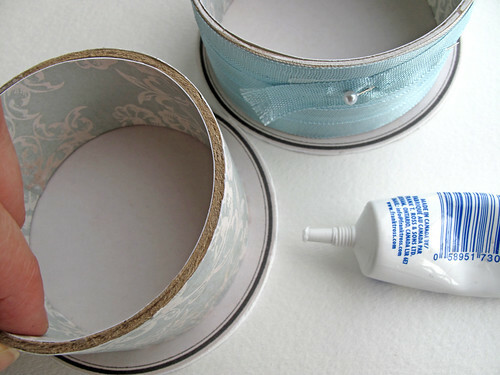 Step 16) Wrap the outside of the bottom (larger) ring with ribbon. 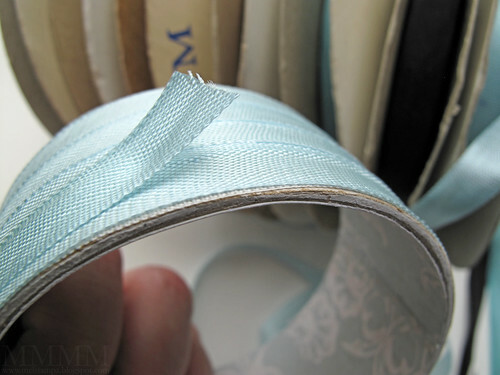 (I used some very affordable white seam-binding ribbon as an initial base, so that I could use less of the blue antique seam-binding that I finished with). 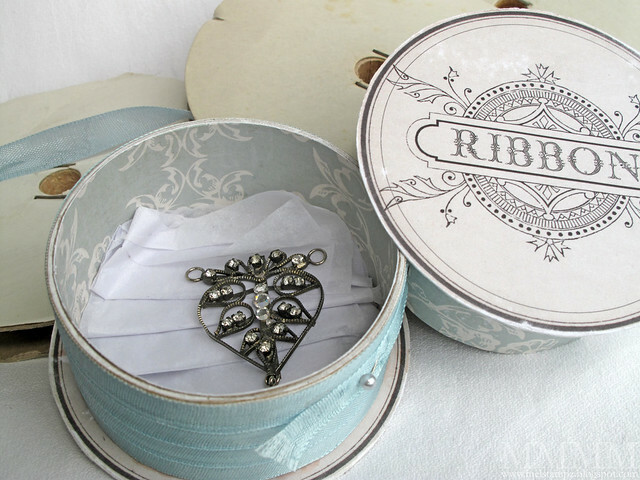 Step 17) Finish wrapping the bottom larger ribbon ring with ribbon. 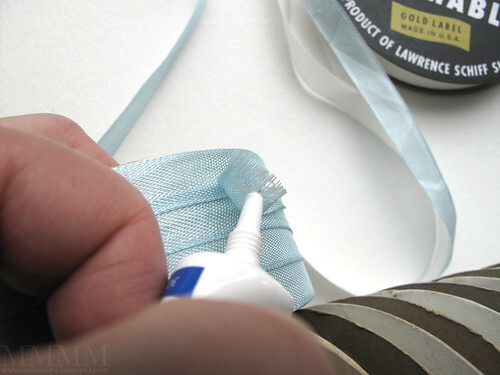 Step 18) If your ribbon is the type that will fray, like this seam-binding, you may want to seal the end with a bit of glue as a fray check. (I used Weldbond glue since it dries matte and isn't visible). 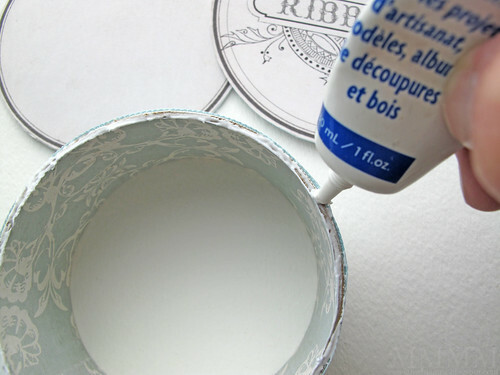 Step 19) Add a pearl pin as a finishing touch, pushing it into the cardboard to secure it. 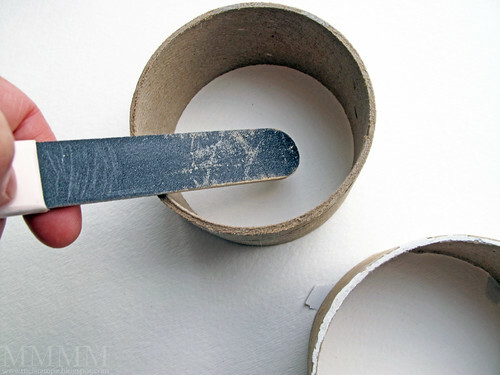 If it's very sharp, you might want to sand the end to dull it down a little. 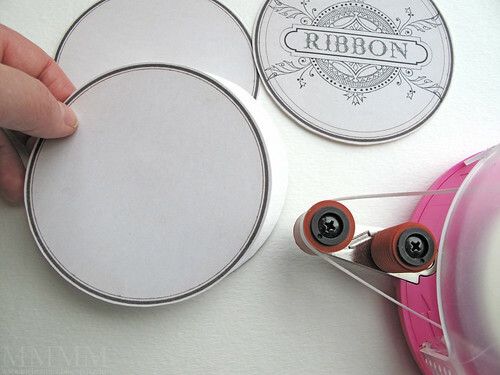 Step 20) Add your adhesive of choice to the bottom of each ribbon ring. (I used more Weldbond glue). 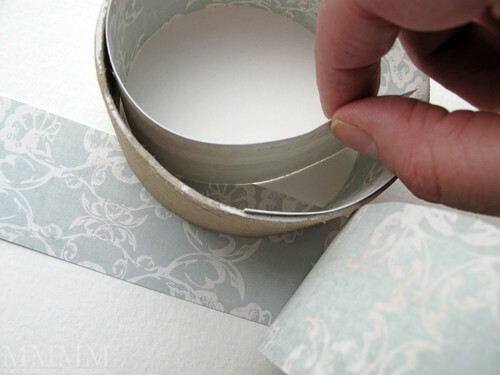 Step 22) Adhere the two patterned paper circles to the inside of the box bottom & top. 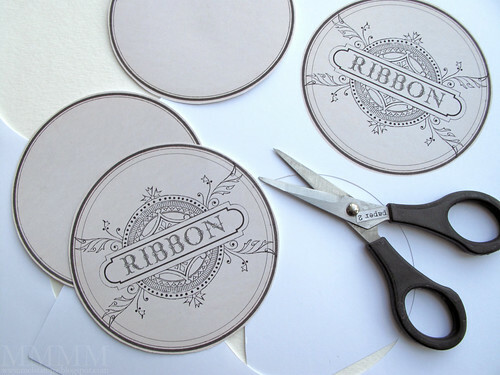 (The circles that you traced and cut from patterned paper in step 11). P.S. Quick links: Paper Craft Planet can be found here. Not a member yet? It's free & easy to sign up here. 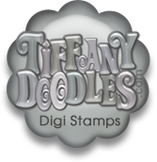 Once you are signed in, the 3D challenge page is here. Magnificent!!! A lovely surprise. Perfect for a Mother's Day gift. You are totally amazing! In addition to being crazy talented, you are incredibly generous. Thank you so much for this gorgeous project & tute. totally fabulous, gorgeous 3-D project, Mel!!! and what fun too!!! ohhhhhh, a secret compartment....I love it! 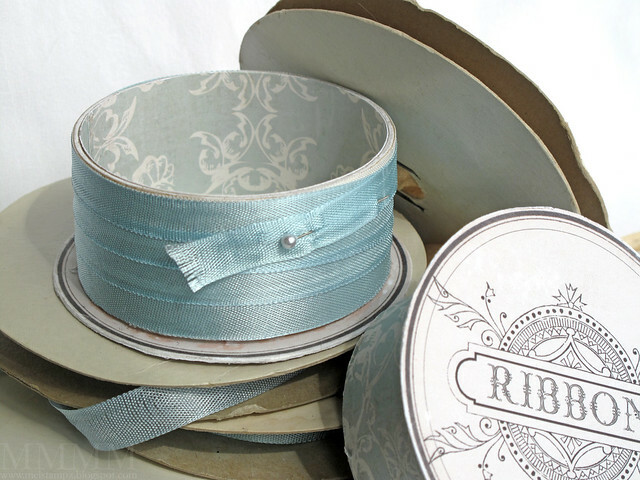 and a few empty ribbon rolls are sitting in my closet waiting for a good idea ;). Now to figure out how to guy-ify it to make a treasure chest for a 7 yr old....Thanks Mel, glad to see you back! Oh this is so uber cool! Love it! It would be super sweet for a Mom's day gift! Woo Hoo! 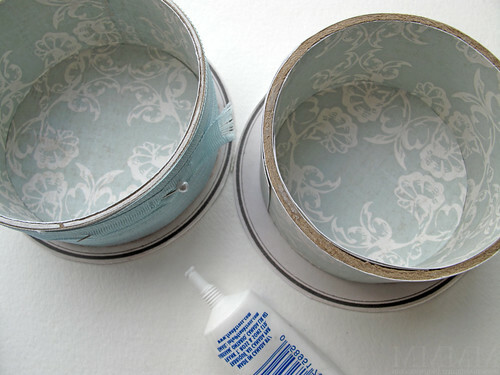 I have been saving empty spools from ribbon and packing tape for ages and now I have something to use them for. Thanks for the inspiration and tutorial--you're the best! Lol, your so funny! Great project with timeless beauty! I love it! I would be happy to get just the box, then I could hide my own goodies in it. Just saw this in person.. IT IS BEAUTIFUL! Love love love it!!! Again... so talented! So jealous! 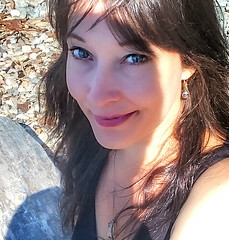 It's me again, I open my blog with such anticipation wondering if I have a comment on a post or if I have a brand new follower and there you are. I feel very honored to have you following my humble blog. This is our first warm and sunny spring week, so this is going to be short and sweet, because I want to get back outside and soak it all in . . isn’t life good. Thank you for the sweet comments on my blog. Yep, you can't beat The Beattles, their music will live on forever. By the way I know I've already said this, but, "Your Blog Rocks!" Hallo, so happy to stumble upon your site. 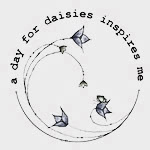 Have added you to my blog so others can find you as well. Gorgeousness+ ingenuousness! what a super fabulous idea Mel! Gorgeous! I love this- but I love everything you create! Such a clever idea. Thank you for being so generous with sharing your ideas and stuff you make!